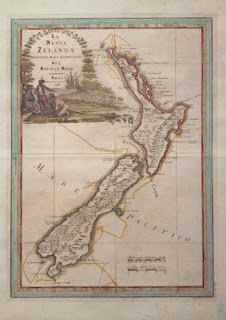 The recent acquisition of the entire range of reproduction prints of some of NZ's most famous antique maps from Wellington publisher Thorndon Fine Prints is not the only news on the map front here at New Zealand Fine Prints. Although the decorative antique maps based on the charts of Captain Cook are consistently among the top selling prints in New Zealand we knew that there is another rich vein of highly decorative vintage maps in official government publications and commercially produced atlases. Maps have been framed as wall art for hundreds of years, although the original maps are very expensive due to their rarity and age superb quality reproduction prints can be re-printed where the original maps are in good condition. The decision of whether to clean up the wear and tear of the antique maps is one that each publisher wrestles with, our view is that reproducing the fold lines on an original map does not detract from its decorative appeal on the wall - the patina of age does in fact add interest and authenticity (without pretending to be an actual original antique map of course!). The new print in stock from Thorndon Fine Prints of the highly decorative chart of NZ drawn by Cassini (shown here) is a great example of an exact replica/facsimile that reproduces folds, foxing and of course the unique hand colouring of the original map. The wall chart style vintage maps that have been printed on canvas are an interesting new product. Customers appreciate purchasing a map that is ready to hang - and the old school aged wooden hangers and rope together with the just the right shade of canvas colour works really well. We like the fact that because we can still roll these vintage maps on canvas up to place in our standard mailing tubes we can deliver them at our standard delivery charge ($6 NZ, $15 worldwide) rather than the framed print shipping cost of $20! However as with all new products our catalogue manager's enthusiasm for the category may not be matched by actual sales (this writer is looking at all those vintage letterpress posters). We have sold a couple of dozen of the wall chart style vintage maps in the past couple of weeks so we are hopeful that this is a good start that will build as more people see the maps in real life hanging on the walls of homes and offices. 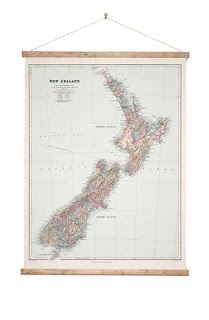 Our complete collection of vintage maps, prints of antique maps and of course a modern day NZ map poster that we have for sale can be viewed here in our map collection. A great article I must say! The prints depict the beautiful country of New Zealand in an antique manner. I'm sure many of your readers will love to have a vintage wall chart style maps on canvas in their living space.